Plate tectonics (from the Late Latin tectonicus, from the Greek : τεκτονικός "pertaining to building")  is a scientific theory describing the large-scale motion of seven large plates and the movements of a larger number of smaller plates of the Earth's lithosphere, since tectonic processes began on Earth between 3 and 3.5 billion years ago. The model builds on the concept of continental drift, an idea developed during the first decades of the 20th century. The geoscientific community accepted plate-tectonic theory after seafloor spreading was validated in the late 1950s and early 1960s. The asthenosphere is the highly viscous, mechanically weak and ductilely deforming region of the upper mantle of the Earth. It lies below the lithosphere, at depths between approximately 80 and 200 km below the surface. The Lithosphere-Asthenosphere boundary is usually referred to as LAB. The asthenosphere is almost solid, although some of its regions could be molten. The lower boundary of the asthenosphere is not well defined. The thickness of the asthenosphere depends mainly on the temperature. However, the rheology of the asthenosphere also depends on the rate of deformation, which suggests that the asthenosphere could be also formed as a result of a high rate of deformation. In some regions the asthenosphere could extend as deep as 700 km (430 mi). It is considered the source region of mid-ocean ridge basalt (MORB). The key principle of plate tectonics is that the lithosphere exists as separate and distinct tectonic plates , which ride on the fluid-like (visco-elastic solid) asthenosphere. Plate motions range up to a typical 10–40 mm/year (Mid-Atlantic Ridge; about as fast as fingernails grow), to about 160 mm/year (Nazca Plate; about as fast as hair grows). The driving mechanism behind this movement is described below. Tectonic lithosphere plates consist of lithospheric mantle overlain by one or two types of crustal material: oceanic crust (in older texts called sima from silicon and magnesium) and continental crust ( sial from silicon and aluminium). Average oceanic lithosphere is typically 100 km (62 mi) thick;  its thickness is a function of its age: as time passes, it conductively cools and subjacent cooling mantle is added to its base. Because it is formed at mid-ocean ridges and spreads outwards, its thickness is therefore a function of its distance from the mid-ocean ridge where it was formed. For a typical distance that oceanic lithosphere must travel before being subducted, the thickness varies from about 6 km (4 mi) thick at mid-ocean ridges to greater than 100 km (62 mi) at subduction zones; for shorter or longer distances, the subduction zone (and therefore also the mean) thickness becomes smaller or larger, respectively. Continental lithosphere is typically about 200 km thick, though this varies considerably between basins, mountain ranges, and stable cratonic interiors of continents. The location where two plates meet is called a plate boundary. Plate boundaries are commonly associated with geological events such as earthquakes and the creation of topographic features such as mountains, volcanoes, mid-ocean ridges, and oceanic trenches. The majority of the world's active volcanoes occur along plate boundaries, with the Pacific Plate's Ring of Fire being the most active and widely known today. 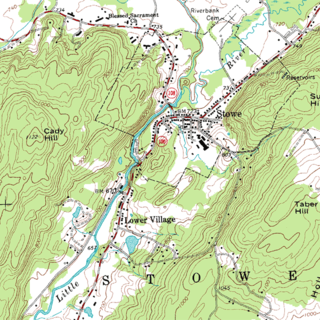 These boundaries are discussed in further detail below. Some volcanoes occur in the interiors of plates, and these have been variously attributed to internal plate deformation  and to mantle plumes. As explained above, tectonic plates may include continental crust or oceanic crust, and most plates contain both. For example, the African Plate includes the continent and parts of the floor of the Atlantic and Indian Oceans. The distinction between oceanic crust and continental crust is based on their modes of formation. Oceanic crust is formed at sea-floor spreading centers, and continental crust is formed through arc volcanism and accretion of terranes through tectonic processes, though some of these terranes may contain ophiolite sequences, which are pieces of oceanic crust considered to be part of the continent when they exit the standard cycle of formation and spreading centers and subduction beneath continents. Oceanic crust is also denser than continental crust owing to their different compositions. Oceanic crust is denser because it has less silicon and more heavier elements ("mafic") than continental crust ("felsic"). As a result of this density stratification, oceanic crust generally lies below sea level (for example most of the Pacific Plate), while continental crust buoyantly projects above sea level (see the page isostasy for explanation of this principle). 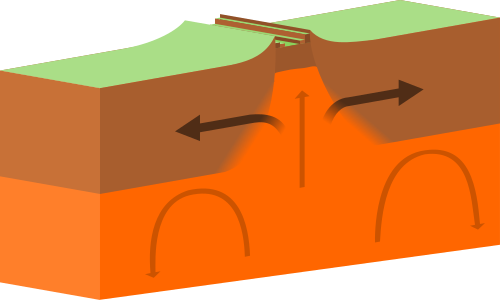 Convergent boundaries (Destructive) (or active margins) occur where two plates slide toward each other to form either a subduction zone (one plate moving underneath the other) or a continental collision. At zones of ocean-to-continent subduction (e.g. the Andes mountain range in South America, and the Cascade Mountains in Western United States), the dense oceanic lithosphere plunges beneath the less dense continent. Earthquakes trace the path of the downward-moving plate as it descends into asthenosphere, a trench forms, and as the subducted plate is heated it releases volatiles, mostly water from hydrous minerals, into the surrounding mantle. The addition of water lowers the melting point of the mantle material above the subducting slab, causing it to melt. 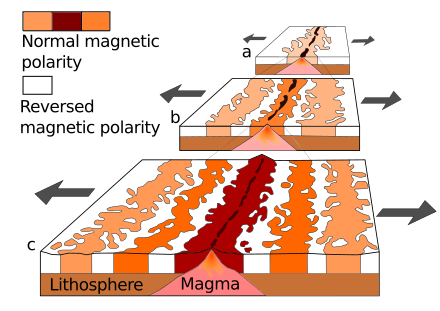 The magma that results typically leads to volcanism. At zones of ocean-to-ocean subduction (e.g. Aleutian islands, Mariana Islands, and the Japanese island arc), older, cooler, denser crust slips beneath less dense crust. This motion causes earthquakes and a deep trench to form in an arc shape. The upper mantle of the subducted plate then heats and magma rises to form curving chains of volcanic islands. Deep marine trenches are typically associated with subduction zones, and the basins that develop along the active boundary are often called "foreland basins". Closure of ocean basins can occur at continent-to-continent boundaries (e.g., Himalayas and Alps): collision between masses of granitic continental lithosphere; neither mass is subducted; plate edges are compressed, folded, uplifted. It has generally been accepted that tectonic plates are able to move because of the relative density of oceanic lithosphere and the relative weakness of the asthenosphere. Dissipation of heat from the mantle is acknowledged to be the original source of the energy required to drive plate tectonics through convection or large scale upwelling and doming. The current view, though still a matter of some debate, asserts that as a consequence, a powerful source of plate motion is generated due to the excess density of the oceanic lithosphere sinking in subduction zones. When the new crust forms at mid-ocean ridges, this oceanic lithosphere is initially less dense than the underlying asthenosphere, but it becomes denser with age as it conductively cools and thickens. 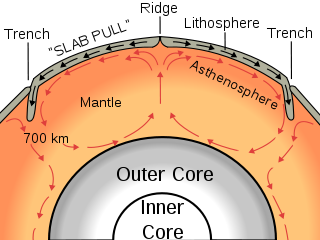 The greater density of old lithosphere relative to the underlying asthenosphere allows it to sink into the deep mantle at subduction zones, providing most of the driving force for plate movement. The weakness of the asthenosphere allows the tectonic plates to move easily towards a subduction zone. Although subduction is thought to be the strongest force driving plate motions, it cannot be the only force since there are plates such as the North American Plate which are moving, yet are nowhere being subducted. The same is true for the enormous Eurasian Plate. The sources of plate motion are a matter of intensive research and discussion among scientists. One of the main points is that the kinematic pattern of the movement itself should be separated clearly from the possible geodynamic mechanism that is invoked as the driving force of the observed movement, as some patterns may be explained by more than one mechanism. In short, the driving forces advocated at the moment can be divided into three categories based on the relationship to the movement: mantle dynamics related, gravity related (mostly secondary forces), and earth rotation related. For much of the last quarter century, the leading theory of the driving force behind tectonic plate motions envisaged large scale convection currents in the upper mantle, which can be transmitted through the asthenosphere. This theory was launched by Arthur Holmes and some forerunners in the 1930s  and was immediately recognized as the solution for the acceptance of the theory as originally discussed in the papers of Alfred Wegener in the early years of the century. However, despite its acceptance, it was long debated in the scientific community because the leading theory still envisaged a static Earth without moving continents up until the major breakthroughs of the early sixties. Lately, the convection theory has been much debated, as modern techniques based on 3D seismic tomography still fail to recognize these predicted large scale convection cells. [ citation needed ] Alternative views have been proposed. 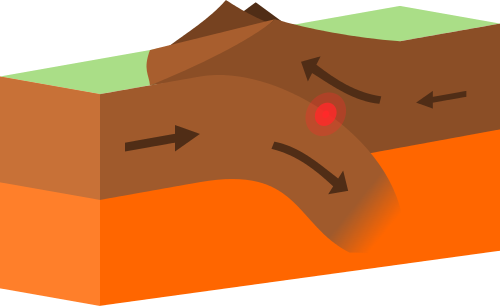 Gravitational sliding away from a spreading ridge: According to many authors, plate motion is driven by the higher elevation of plates at ocean ridges. As oceanic lithosphere is formed at spreading ridges from hot mantle material, it gradually cools and thickens with age (and thus adds distance from the ridge). Cool oceanic lithosphere is significantly denser than the hot mantle material from which it is derived and so with increasing thickness it gradually subsides into the mantle to compensate the greater load. The result is a slight lateral incline with increased distance from the ridge axis. Slab-pull: Current scientific opinion is that the asthenosphere is insufficiently competent or rigid to directly cause motion by friction along the base of the lithosphere. Slab pull is therefore most widely thought to be the greatest force acting on the plates. 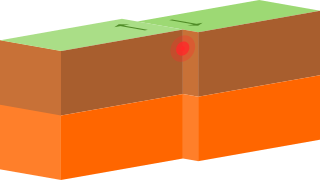 In this current understanding, plate motion is mostly driven by the weight of cold, dense plates sinking into the mantle at trenches. Recent models indicate that trench suction plays an important role as well. However, the fact that the North American Plate is nowhere being subducted, although it is in motion, presents a problem. The same holds for the African, Eurasian, and Antarctic plates. Alfred Wegener, being a meteorologist, had proposed tidal forces and centrifugal forces as the main driving mechanisms behind continental drift; however, these forces were considered far too small to cause continental motion as the concept was of continents plowing through oceanic crust. Therefore, Wegener later changed his position and asserted that convection currents are the main driving force of plate tectonics in the last edition of his book in 1929. In 1973, George W. Moore  of the USGS and R. C. Bostrom  presented evidence for a general westward drift of the Earth's lithosphere with respect to the mantle. 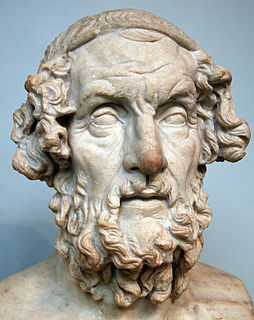 He concluded that tidal forces (the tidal lag or "friction") caused by the Earth's rotation and the forces acting upon it by the Moon are a driving force for plate tectonics. As the Earth spins eastward beneath the moon, the moon's gravity ever so slightly pulls the Earth's surface layer back westward, just as proposed by Alfred Wegener (see above). In a more recent 2006 study,  scientists reviewed and advocated these earlier proposed ideas. It has also been suggested recently in Lovett (2006) that this observation may also explain why Venus and Mars have no plate tectonics, as Venus has no moon and Mars' moons are too small to have significant tidal effects on the planet. In a recent paper,  it was suggested that, on the other hand, it can easily be observed that many plates are moving north and eastward, and that the dominantly westward motion of the Pacific Ocean basins derives simply from the eastward bias of the Pacific spreading center (which is not a predicted manifestation of such lunar forces). In the same paper the authors admit, however, that relative to the lower mantle, there is a slight westward component in the motions of all the plates. They demonstrated though that the westward drift, seen only for the past 30 Ma, is attributed to the increased dominance of the steadily growing and accelerating Pacific plate. The debate is still open. One of the most significant correlations discovered to date is that lithospheric plates attached to downgoing (subducting) plates move much faster than plates not attached to subducting plates. 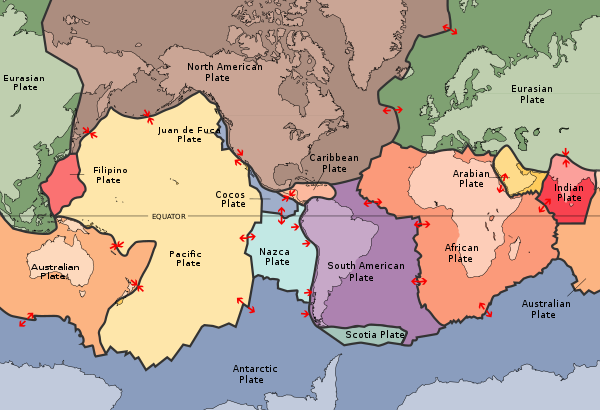 The Pacific plate, for instance, is essentially surrounded by zones of subduction (the so-called Ring of Fire) and moves much faster than the plates of the Atlantic basin, which are attached (perhaps one could say 'welded') to adjacent continents instead of subducting plates. It is thus thought that forces associated with the downgoing plate (slab pull and slab suction) are the driving forces which determine the motion of plates, except for those plates which are not being subducted. This view however has been contradicted by a recent study which found that the actual motions of the Pacific Plate and other plates associated with the East Pacific Rise do not correlate mainly with either slab pull or slab push, but rather with a mantle convection upwelling whose horizontal spreading along the bases of the various plates drives them along via viscosity-related traction forces. The driving forces of plate motion continue to be active subjects of on-going research within geophysics and tectonophysics. In line with other previous and contemporaneous proposals, in 1912 the meteorologist Alfred Wegener amply described what he called continental drift, expanded in his 1915 book The Origin of Continents and Oceans  and the scientific debate started that would end up fifty years later in the theory of plate tectonics. Starting from the idea (also expressed by his forerunners) that the present continents once formed a single land mass (which was called Pangea later on) that drifted apart, thus releasing the continents from the Earth's mantle and likening them to "icebergs" of low density granite floating on a sea of denser basalt. Supporting evidence for the idea came from the dove-tailing outlines of South America's east coast and Africa's west coast, and from the matching of the rock formations along these edges. Confirmation of their previous contiguous nature also came from the fossil plants Glossopteris and Gangamopteris , and the therapsid or mammal-like reptile Lystrosaurus , all widely distributed over South America, Africa, Antarctica, India, and Australia. The evidence for such an erstwhile joining of these continents was patent to field geologists working in the southern hemisphere. The South African Alex du Toit put together a mass of such information in his 1937 publication Our Wandering Continents, and went further than Wegener in recognising the strong links between the Gondwana fragments. The discovery of radioactivity and its associated heating properties in 1895 prompted a re-examination of the apparent age of the Earth. This had previously been estimated by its cooling rate under the assumption that the Earth's surface radiated like a black body. Those calculations had implied that, even if it started at red heat, the Earth would have dropped to its present temperature in a few tens of millions of years. Armed with the knowledge of a new heat source, scientists realized that the Earth would be much older, and that its core was still sufficiently hot to be liquid. By 1915, after having published a first article in 1912,  Alfred Wegener was making serious arguments for the idea of continental drift in the first edition of The Origin of Continents and Oceans. In that book (re-issued in four successive editions up to the final one in 1936), he noted how the east coast of South America and the west coast of Africa looked as if they were once attached. Wegener was not the first to note this (Abraham Ortelius, Antonio Snider-Pellegrini, Eduard Suess, Roberto Mantovani and Frank Bursley Taylor preceded him just to mention a few), but he was the first to marshal significant fossil and paleo-topographical and climatological evidence to support this simple observation (and was supported in this by researchers such as Alex du Toit). Furthermore, when the rock strata of the margins of separate continents are very similar it suggests that these rocks were formed in the same way, implying that they were joined initially. For instance, parts of Scotland and Ireland contain rocks very similar to those found in Newfoundland and New Brunswick. Furthermore, the Caledonian Mountains of Europe and parts of the Appalachian Mountains of North America are very similar in structure and lithology. During the 20th century, improvements in and greater use of seismic instruments such as seismographs enabled scientists to learn that earthquakes tend to be concentrated in specific areas, most notably along the oceanic trenches and spreading ridges. By the late 1920s, seismologists were beginning to identify several prominent earthquake zones parallel to the trenches that typically were inclined 40–60° from the horizontal and extended several hundred kilometers into the Earth. These zones later became known as Wadati–Benioff zones, or simply Benioff zones, in honor of the seismologists who first recognized them, Kiyoo Wadati of Japan and Hugo Benioff of the United States. The study of global seismicity greatly advanced in the 1960s with the establishment of the Worldwide Standardized Seismograph Network (WWSSN)  to monitor the compliance of the 1963 treaty banning above-ground testing of nuclear weapons. The much improved data from the WWSSN instruments allowed seismologists to map precisely the zones of earthquake concentration worldwide. Meanwhile, debates developed around the phenomena of polar wander. Since the early debates of continental drift, scientists had discussed and used evidence that polar drift had occurred because continents seemed to have moved through different climatic zones during the past. Furthermore, paleomagnetic data had shown that the magnetic pole had also shifted during time. Reasoning in an opposite way, the continents might have shifted and rotated, while the pole remained relatively fixed. The first time the evidence of magnetic polar wander was used to support the movements of continents was in a paper by Keith Runcorn in 1956,  and successive papers by him and his students Ted Irving (who was actually the first to be convinced of the fact that paleomagnetism supported continental drift) and Ken Creer. This was immediately followed by a symposium in Tasmania in March 1956. In this symposium, the evidence was used in the theory of an expansion of the global crust. In this hypothesis the shifting of the continents can be simply explained by a large increase in size of the Earth since its formation. However, this was unsatisfactory because its supporters could offer no convincing mechanism to produce a significant expansion of the Earth. Certainly there is no evidence that the moon has expanded in the past 3 billion years; other work would soon show that the evidence was equally in support of continental drift on a globe with a stable radius. The new data that had been collected on the ocean basins also showed particular characteristics regarding the bathymetry. One of the major outcomes of these datasets was that all along the globe, a system of mid-oceanic ridges was detected. An important conclusion was that along this system, new ocean floor was being created, which led to the concept of the "Great Global Rift". This was described in the crucial paper of Bruce Heezen (1960),  which would trigger a real revolution in thinking. A profound consequence of seafloor spreading is that new crust was, and still is, being continually created along the oceanic ridges. Therefore, Heezen advocated the so-called "expanding Earth" hypothesis of S. Warren Carey (see above). So, still the question remained: how can new crust be continuously added along the oceanic ridges without increasing the size of the Earth? In reality, this question had been solved already by numerous scientists during the forties and the fifties, like Arthur Holmes, Vening-Meinesz, Coates and many others: The crust in excess disappeared along what were called the oceanic trenches, where so-called "subduction" occurred. Therefore, when various scientists during the early sixties started to reason on the data at their disposal regarding the ocean floor, the pieces of the theory quickly fell into place. The question particularly intrigued Harry Hammond Hess, a Princeton University geologist and a Naval Reserve Rear Admiral, and Robert S. Dietz, a scientist with the U.S. Coast and Geodetic Survey who first coined the term seafloor spreading. Dietz and Hess (the former published the same idea one year earlier in Nature ,  but priority belongs to Hess who had already distributed an unpublished manuscript of his 1962 article by 1960)  were among the small handful who really understood the broad implications of sea floor spreading and how it would eventually agree with the, at that time, unconventional and unaccepted ideas of continental drift and the elegant and mobilistic models proposed by previous workers like Holmes. Continental drift theory helps biogeographers to explain the disjunct biogeographic distribution of present-day life found on different continents but having similar ancestors. In particular, it explains the Gondwanan distribution of ratites and the Antarctic flora. The movement of plates has caused the formation and break-up of continents over time, including occasional formation of a supercontinent that contains most or all of the continents. The supercontinent Columbia or Nuna formed during a period of 2,000 to 1,800 million years ago and broke up about 1,500 to 1,300 million years ago . The supercontinent Rodinia is thought to have formed about 1 billion years ago and to have embodied most or all of Earth's continents, and broken up into eight continents around 600 million years ago. The eight continents later re-assembled into another supercontinent called Pangaea; Pangaea broke up into Laurasia (which became North America and Eurasia) and Gondwana (which became the remaining continents). Venus shows no evidence of active plate tectonics. There is debatable evidence of active tectonics in the planet's distant past; however, events taking place since then (such as the plausible and generally accepted hypothesis that the Venusian lithosphere has thickened greatly over the course of several hundred million years) has made constraining the course of its geologic record difficult. However, the numerous well-preserved impact craters have been utilized as a dating method to approximately date the Venusian surface (since there are thus far no known samples of Venusian rock to be dated by more reliable methods). Dates derived are dominantly in the range 500 to 750 million years ago , although ages of up to 1,200 million years ago have been calculated. This research has led to the fairly well accepted hypothesis that Venus has undergone an essentially complete volcanic resurfacing at least once in its distant past, with the last event taking place approximately within the range of estimated surface ages. While the mechanism of such an impressive thermal event remains a debated issue in Venusian geosciences, some scientists are advocates of processes involving plate motion to some extent. One explanation for Venus's lack of plate tectonics is that on Venus temperatures are too high for significant water to be present. The Earth's crust is soaked with water, and water plays an important role in the development of shear zones. Plate tectonics requires weak surfaces in the crust along which crustal slices can move, and it may well be that such weakening never took place on Venus because of the absence of water. However, some researchers[ who? ] remain convinced that plate tectonics is or was once active on this planet. Obduction was originally defined by Coleman to mean the overthrusting of oceanic lithosphere onto continental lithosphere at a convergent plate boundary where continental lithosphere is being subducted beneath oceanic lithosphere. Tectonics is the process that controls the structure and properties of the Earth's crust and its evolution through time. In particular, it describes the processes of mountain building, the growth and behavior of the strong, old cores of continents known as cratons, and the ways in which the relatively rigid plates that constitute the Earth's outer shell interact with each other. Tectonics also provides a framework for understanding the earthquake and volcanic belts that directly affect much of the global population. Tectonic studies are important as guides for economic geologists searching for fossil fuels and ore deposits of metallic and nonmetallic resources. An understanding of tectonic principles is essential to geomorphologists to explain erosion patterns and other Earth surface features. Back-arc basins are geologic basins, submarine features associated with island arcs and subduction zones. They are found at some convergent plate boundaries, presently concentrated in the western Pacific Ocean. Most of them result from tensional forces caused by oceanic trench rollback and the collapse of the edge of the continent. The arc crust is under extension or rifting as a result of the sinking of the subducting slab. Back-arc basins were initially a surprising result for plate tectonics theorists, who expected convergent boundaries to be zones of compression, rather than major extension. However, they are now recognized as consistent with this model in explaining how the interior of Earth loses heat. A submarine, undersea, or underwater earthquake is an earthquake that occurs underwater at the bottom of a body of water, especially an ocean. They are the leading cause of tsunamis. The magnitude can be measured scientifically by the use of the moment magnitude scale and the intensity can be assigned using the Mercalli intensity scale. A continental arc is a type of volcanic arc occurring as an "arc-shape" topographic high region along a continental margin. The continental arc is formed at an active continental margin where two tectonic plates meet, and where one plate has continental crust and the other oceanic crust, and a subduction zone develops. The magmatism and petrogenesis of continental crust are complicated: in essence, continental arcs reflect a mixture of oceanic crust materials, mantle wedge and continental crust materials. ↑ Grove, Timothy L.; Till, Christy B.; Krawczynski, Michael J. (8 March 2012). "The Role of H2O in Subduction Zone Magmatism". Annual Review of Earth and Planetary Sciences. 40 (40): 413–39. Bibcode:2012AREPS..40..413G. doi:10.1146/annurev-earth-042711-105310 . Retrieved 14 January 2016. ↑ Mendia-Landa, Pedro. "Myths and Legends on Natural Disasters: Making Sense of Our World" . Retrieved 2008-02-05. ↑ Holmes, Arthur (1931). "Radioactivity and Earth Movements" (PDF). Transactions of the Geological Society of Glasgow. 18 (3): 559–606. doi:10.1144/transglas.18.3.559. ↑ Casadevall, Arturo; Fang, Ferric C. (1 March 2016). "Revolutionary Science". mBio. 7 (2): e00158–16. doi:10.1128/mBio.00158-16. PMC 4810483 . PMID 26933052. ↑ Torsvik, Trond Helge. "Reconstruction Methods" . Retrieved 18 June 2010. ↑ Dyches, Preston; Brown, Dwayne; Buckley, Michael (8 September 2014). "Scientists Find Evidence of 'Diving' Tectonic Plates on Europa". NASA . Retrieved 8 September 2014. ↑ van Heck, H.J. ; Tackley, P.J. (2011). "Plate tectonics on super-Earths: Equally or more likely than on Earth". Earth and Planetary Science Letters. 310 (3–4): 252–61. Bibcode:2011E&PSL.310..252V. doi:10.1016/j.epsl.2011.07.029. Condie, K.C. (1997). Plate tectonics and crustal evolution (4th ed.). Butterworth-Heinemann. p. 282. ISBN 978-0-7506-3386-4 . Retrieved 2010-06-18. Lippsett, Laurence (2006). "Maurice Ewing and the Lamont-Doherty Earth Observatory". In William Theodore De Bary; Jerry Kisslinger; Tom Mathewson. Living Legacies at Columbia. Columbia University Press. pp. 277–97. ISBN 978-0-231-13884-0 . Retrieved 2010-06-22. Lliboutry, L. (2000). Quantitative geophysics and geology. Eos Transactions. 82. Springer. p. 480. Bibcode:2001EOSTr..82..249W. doi:10.1029/01EO00142. ISBN 978-1-85233-115-3 . Retrieved 2010-06-18. Connerney, J.E.P. ; Acuña, M.H. ; Ness, N.F. ; Kletetschka, G.; Mitchell D.L. ; Lin R.P. ; Rème H. (2005). "Tectonic implications of Mars crustal magnetism". Proceedings of the National Academy of Sciences. 102 (42): 14970–175. Bibcode:2005PNAS..10214970C. doi:10.1073/pnas.0507469102. PMC 1250232 . PMID 16217034.
van Dijk, J.P.; Okkes, F.W.M. (1991). "Neogene tectonostratigraphy and kinematics of Calabrian Basins: implications for the geodynamics of the Central Mediterranean". Tectonophysics . 196 (1): 23–60. Bibcode:1991Tectp.196...23V. doi:10.1016/0040-1951(91)90288-4. Sleep, Norman H. (1994). "Martian plate tectonics" (PDF). Journal of Geophysical Research. 99 (E3): 5639. Bibcode:1994JGR....99.5639S. CiteSeerX 10.1.1.452.2751 . doi:10.1029/94JE00216. Tanimoto, Toshiro; Lay, Thorne (7 November 2000). "Mantle dynamics and seismic tomography". Proceedings of the National Academy of Sciences. 97 (23): 12409–110. Bibcode:2000PNAS...9712409T. doi:10.1073/pnas.210382197. PMC 34063 . PMID 11035784. Valencia, Diana; O'Connell, Richard J.; Sasselov, Dimitar D (November 2007). "Inevitability of Plate Tectonics on Super-Earths". Astrophysical Journal Letters. 670 (1): L45–L48. arXiv: 0710.0699 . Bibcode:2007ApJ...670L..45V. doi:10.1086/524012. Zhong, Shijie; Zuber, Maria T. (2001). "Degree-1 mantle convection and the crustal dichotomy on Mars" (PDF). Earth and Planetary Science Letters. 189 (1–2): 75–84. Bibcode:2001E&PSL.189...75Z. CiteSeerX 10.1.1.535.8224 . doi:10.1016/S0012-821X(01)00345-4. Wikimedia Commons has media related to Plate tectonics .